An undated photo of Katie Snyder Evans with her premature twin girls. SANTA CLARITA, Calif. -- A mother of six was killed in a crash after being side-swiped by another driver in Santa Clarita, California on Friday night, authorities said. The crash happened shortly before midnight in the area of Golden Valley and Soledad Canyon roads, according to officials from the Santa Clarita Valley Sheriff's Station. A car traveling southbound on Golden Valley Road struck a curb, forcing the car to side-swipe a second vehicle traveling northbound and causing it to roll over, officials said. A woman in the second vehicle, identified by family and friends as Katie Snyder Evans, was ejected and died at the scene, sheriff's officials said. The driver of the first vehicle was injured. The extent of the person's injuries was not known. The cause of the crash remained under investigation, but officials were looking into whether alcohol played a factor in the collision. No arrests were immediately made. 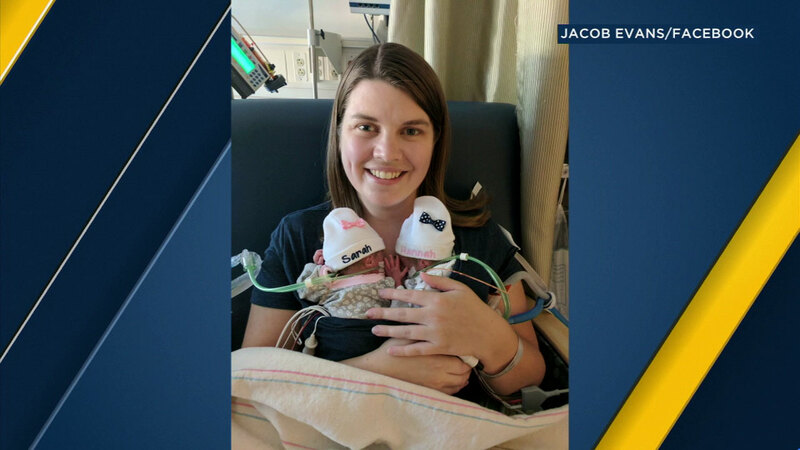 Evans, 37, was returning home from visiting her premature twins in the hospital. Her death came as her twin girls, who weren't expected to survive, are thriving. Evans leaves behind her husband, twins and four other children, ages 12, 11, 9 and 2. "That's the irony, right? Is that you have dozens of medical professionals who have spent years training, and they've spent months actually working to save two lives that we thought would be lost, and then we have a life we thought we'd have that was lost just because of two bad decisions: one to go out drinking and the other -- worse one -- to drive afterward, and obviously it breaks my heart and it's broken six little hearts," said husband Jacob Evans.